DOMESTIC VIOLENCE - Onome Talk Am! An Instagram user shared a photo of a woman who she said is her hairstylist, with injuries on her face and her neck, saying she was badly beaten by her husband. 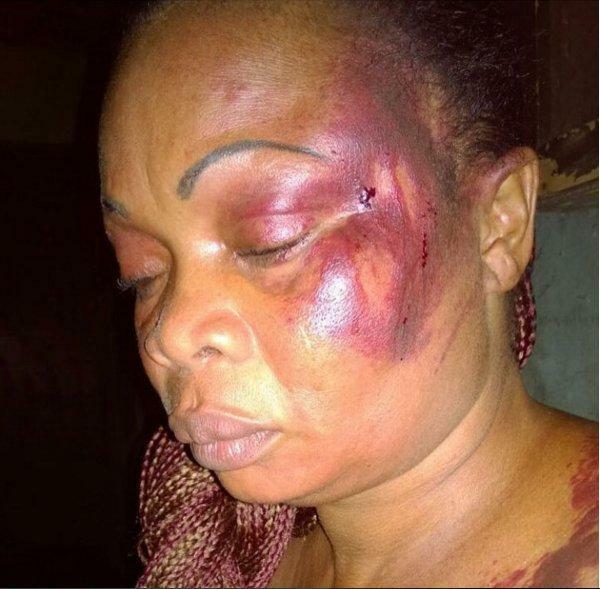 According to her, the victim shared the picture on one of her social networks, and she called to ask what happened, only to find out from the victim that her husband allegedly beat her up. When asked why her husband did that to her, she said the man accused her of being too proud because she has a successful business. She also said that the victim alleged that this is not the first time it is happening. I’m sad!!! This is my hairstylist! Looking at this picture, I am saddened and all I can ask is why will a husband do this to a wife he promised to protect, if a wife is hardworking and earns more than her husband; isn’t it to the benefits of the man since she will assist him in the financial matters of the home? Why will a man allow inferiority complex push him to this extent? I know for a fact that real men don’t beat their women, they would rather take a walk. I look forward to a world with no case of domestic violence either from a man to a woman or vice-versa ; yea, men are also victims.#saynotodomesticviolence.